Just a few weeks after having returned from the 4L Trophy, Tanguy Forcade and Alexandre Piquer tell us more about this adventure. Let’s watch their video here. The humanitarian dimension was what motivated you. Are you satisfied with the amount of money raised? 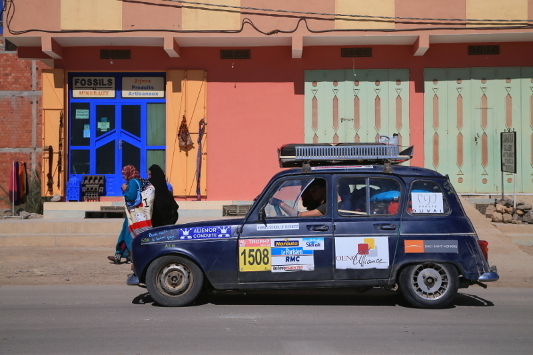 The rally raised over 36,000 euros. The “Enfants du Désert” Association can build three schools with this. Over 20,000 children will take advantage of the supplies we brought in. How were you able to speak to the locals? We spoke with the local populations several times when we went to garages. The owners were very hospitable. They served us tea and Moroccan pastries. In the desert, there were indigenous people always ready to assist us. When we were trapped in the sand, for instance. They speak easily. Even though they don’t speak French well, they try. Was there a lot of mutual assistance during the rally? In Spain, we met up with three teams, including Vatel Lyon’s team. We all slept together in Hervas. Then we continued with six other cars in the desert and we stayed together until the end of the race. We always slept and ate together. And when we went to repair our cars in garages, we saw about ten duos. Some of them continued the rally. But some of them unfortunately couldn’t. Are you satisfied with your sporting performances? We’re quite satisfied with our orientation and driving performances. But we had quite a few mechanical problems that we weren’t expecting. That’s a little disappointing. Before leaving, you were sure that you were going to learn a lot. So, what did you learn? We learned how to push beyond our limits during hardships, and not to give up. We wanted to continue and had even more motivation to get to the end of this adventure. Would you be ready to take part in the rally next year? Both of us are ready to leave again for this adventure. We advise all students to do it, it’s an extraordinary experience. For myself, the next few years are going to be intense for my schooling. So I don’t think I’ll be able to do it again. (Tanguy). I hope I can do the rally again and that I’ll be better prepared this time (Alexandre).